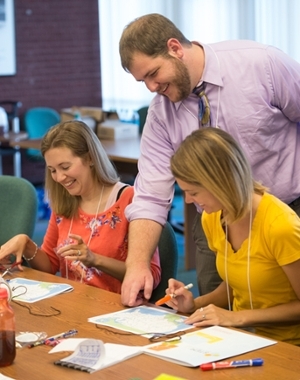 The workshop was offered June 20-21 in Springfield and June 27-28 in SIUE’s Lovejoy Library. Approximately 20 area teachers attended the workshop to gain inspiration for their lesson planning. During the workshop, attending educators are practicing primary source analysis through mapping activities. This professional development offering aligns with the University’s values of citizenship and wisdom. The Teaching with Primary Sources Program at Southern Illinois University Edwardsville (TPS SIUE) is funded by a grant from the Library of Congress and is a member of the TPS Educational Consortium. Members of the TPS Educational Consortium assist in the design of the TPS program and offer TPS professional development on an ongoing basis, year-round. The mission of the Teaching with Primary Sources program is to build awareness of the Library's educational initiatives, provide content that promotes the effective educational use of the Library's resources, and offer access to and promote sustained use of the Library's educational resources. The Library achieves this mission through collaborations between the Library and the K-12 educational community across the United States. The program contributes to the quality of education by assisting teachers in their use of the Library's digitized primary sources to engage students, develop their critical thinking skills and construct knowledge. Learn more about the Library's TPS program and other resources available to teachers at www.loc.gov/teachers. Photo: Matt Johnson, instructional design and curriculum specialist with the SIUE STEM Center, instructs workshop attendees on how to integrate STEM into history lessons.